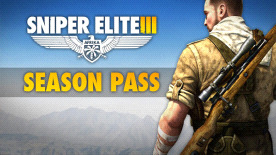 Prepare for a wealth of new Sniper Elite 3 downloadable content and save up to 55%* with the Sniper Elite 3 Season Pass. With new content dropping regularly for single player and multiplayer after launch, just like an elite sniper you won’t want to miss a thing! Please note: There will also be FOUR new multiplayer maps made FREE to all Sniper Elite 3 players. This is to continue our policy of not dividing our loyal multiplayer community. *Discount varies slightly by region due to currency variations. Sniper Elite 3 Season Pass discount is compared to purchasing all Sniper Elite 3 DLC separately.